Healthy eating advice can be confusing, and recommendations to reduce the amount of sugar in our diet can leave us wondering ‘how much is too much?’ Should we be sourcing low sugar snacks for kids, or getting sugar swap ideas to replace their sweet treats with something better for them? It’s not recommended that we cut sugar completely from their diets. The occasional treats are fine. But the effects of sugar on children can be obvious, especially in their younger years, when too much of it leads them to become hyper – followed by a tearful comedown afterwards. Obviously, as they grow it’s the extra calories which can lead to weight gain and health issues which we’re also concerned about. So these simple guidelines should give you an idea of what to aim for when it comes to daily sugar intake. Child health is so important, after all. And by instilling good habits from a young age, we’re setting them up for a long and healthy life. This might seem fairly straightforward, until you realise that a single can of fizzy drink contains around 9 teaspoons of sugar. This is why healthy snacks for children are so important. We consume a certain amount of ‘free sugars’ in our diet – the sugars which naturally occur in fruit juices and syrups, or those which are already added to foods. So the guidelines above are to prevent us from adding too much. 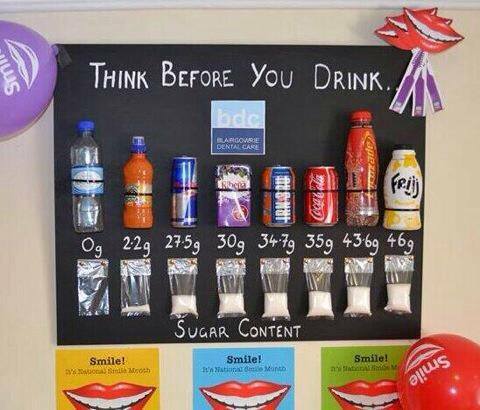 You might have seen this image being shared on social media – created by a clever teacher who wanted to get the message home about the hidden sugars in our everyday drinks. So what sort of swaps do we recommend? Well, as you can see from the above, nothing beats water for quenching the thirst without rotting their teeth. But if they like their fizzy beverages, try some sparkling water with a little unsweetened fruit juice added. A glass of cold milk is also high in calcium, but if that’s too plain try blending some fruit with ice and milk to make a delicious smoothie. Other effective sugar swap ideas would be to take away their sweet cereals in favour of crumpets or bagels, or even some granary toast with a thin spread of jam. And instead of biscuits or sweets, always have some low sugar snacks for kids, such as breadsticks with cheese or houmous, rice cakes with peanut butter, or even a plain scone is better for them. Using these sugar swap ideas during the week also means they can look forward to a sweet treat at the weekends – it does them no harm. But the most important tip of all is to become a role model. Practise what you preach and let youngsters see you setting a good example. It will benefit the whole family in the long run.